LOWER EAST SIDE, Manhattan (WPIX) — A 34-year-old man was arrested after police say he broke the window where a Confederate flag was hanging at a Lower East Side apartment. Police sources say officers were on Avenue D just before 9 p.m. when they heard glass breaking above them. When they went to investigate, they found a bloody trail into the neighboring apartment. Officers knocked on the door to find the 34-year-old suspect bloodied and admitting to breaking the window. Officers have not yet been able to reach the tenant of the apartment. With Confederate flags adorning apartment window's in Manhattan’s East Village, it's clear that the Confederacy’s role in modern day America is not just a Dixie dilemma for Southerners. “We don’t like it," said neighbor Jamie May. "After Charlottesville, it’s quite horrifying." Those flags join endangered Confederate plaques and busts spread across the North. They all have a new, controversial endorsement from our nation’s President. 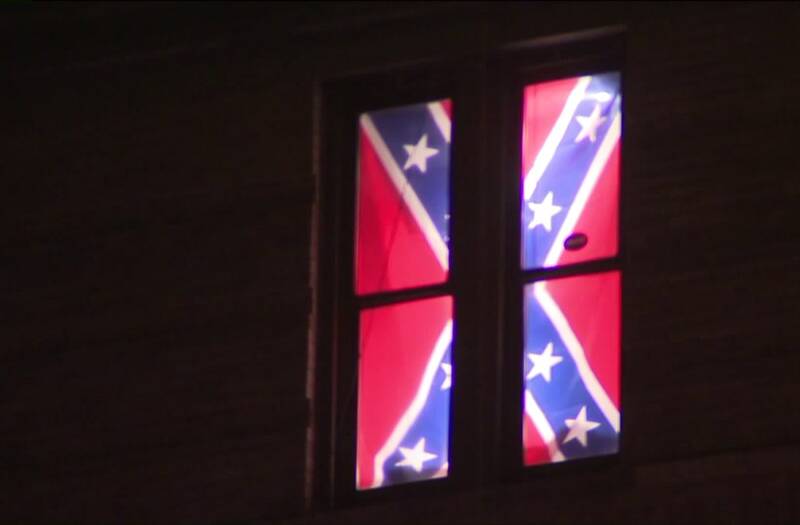 A 34-year-old man was arrested after police say he broke the window where a Confederate flag was hanging at a New York apartment. “Sad to see the history and culture of our great country being ripped apart with the removal of our beautiful statues and monuments. You can’t change history, but you can learn from it. Robert E Lee, Stonewall Jackson - who’s next, Washington, Jefferson? So foolish," Trump tweeted. Former Trump Virginia campaign chairman Corey Stewart worries about a slippery slope. “The left isn’t doing this just to redecorate some parks across the country," Stewart said. "They’re going after the constitution." History actually tells us a lot about the Confederacy: its values, monuments and what it means to support them. In his landmark 1861 “Cornerstone” speech, Confederate Vice President Alexander Stephens argued abolitionists who believed in racial equality were simply wrong. Putting aside for a moment how you feel about the fight over busts of Confederate General Robert E. Lee, the truth is Lee advocated, fought and lost for the South’s right to enslave African-Americans - a position he explained in an 1856 letter to his wife. “The blacks are immeasurably better off here than in Africa, morally, socially & physically. The painful discipline they are undergoing, is necessary for their instruction as a race,” Lee wrote. Fordham University History Professor Christopher Dietrich says comparisons between General Lee and those who founded our nation are inappropriate. “The founding fathers wrote the principles that are our political - economic democracy stands on. And generals like Lee, like Jefferson Davis, broke with that in order to uphold the system of slavery,” said Professor Dietrich.